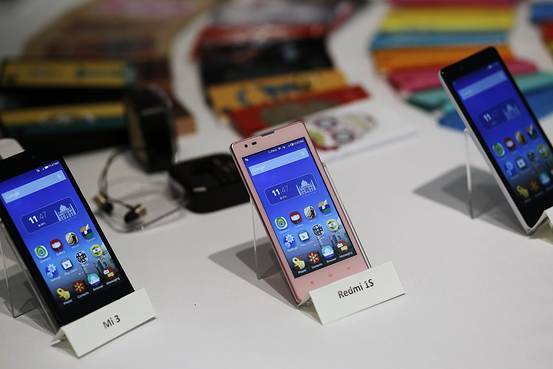 Three models of China’s Xiaomi Mi phones are pictured during their launch in New Delhi on July 15, 2015. JAKARTA, Indonesia—Chinese smartphone maker Xiaomi Inc. has linked up for the first time with a major mobile operator in Indonesia, PT XL Axiata, to widen its reach and solve unmet demand in gadget-crazy Indonesia, says a company executive. The move will allow Xiaomi to sell its low-cost devices through more offline retailers, and is one the company deems necessary to fulfill growing demand in the world’s fourth-most populous country. “We work with network operators to help increase both awareness of Xiaomi’s products and [to] offer something valuable to our consumers,” Steve Vickers, general manager of Xiaomi in Southeast Asia, told The Wall Street Journal after a news conference. Xiaomi has partnered with XL to sell its new, 4G-compatible smartphone, the Redmi 2, which will come bundled with the mobile operator’s SIM cards. The bundling began Saturday and will be available until May 31. The offer will only be accessible to consumers in big cities where XL has rolled out its 4G service, such as Jakarta, Yogyakarta, Bogor and Medan, XL said in a press conference Friday. “But we’re happy for customers to attach our products to whichever network they want,” Mr. Vickers said. Xiaomi also sells its products through ecommerce site Lazada and retailers OkeShop and Erafone. The 1.5 million-rupiah ($115) Redmi 2, a 4.7-inch smartphone, is the successor to the Redmi 1S, the first product Beijing-based Xiaomi launched in Indonesia more than six months ago. On Wednesday, Xiaomi released 40,000 Redmi 2 smartphones in a flash sale here, months after it hit the market in China. Xiaomi also rolled out its Mi Pad phablet, which was first sold in its home market almost a year ago. The phones were sold exclusively through Lazada as part of an Asian-wide festival to celebrate the company’s fifth anniversary. All 40,000 Redmi 2 devices sold out within the day. Indonesia Real Time talked to Mr. Vickers about Xiaomi’s efforts to meet growing demand in Indonesia and its plans to accelerate new product launchings. Edited excerpts. 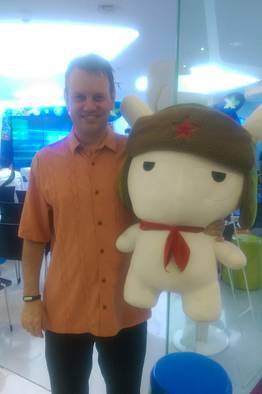 Steve Vickers, general manager for Xiaomi in Southeast Asia, posed with the companys mascot at a news conference in Jakarta, Indonesia, on April 10. WSJ: What do you think of the 40,000 Redmi 2 units sold in Indonesia during their first flash sale? Mr. Vickers: 40,000 is great, but we have no specific target in mind. And the fact that everything sold out within a short period of time is great news, but that still leaves a lot of unmet demand out there in Indonesia. WSJ: What does it indicate about where Xiaomi needs to go from here? Mr. Vickers: Xiaomi is typically a cautious company in terms of the inventory we look to push into the marketplace. Our model of social media-based advertising and word-of mouth marketing does not give us the luxury of [having] companies that have huge TV advertising budgets. Clearly we’ve managed to sell out products in a short period of time, so next we’re looking to bring in more. We look to continue increasing the supply as long as demand remains strong. We’re probably going to launch three or four more products later this year. WSJ: Are you optimistic that the demand will remain strong here? Mr. Vickers: The Indonesian market is growing fast. We are fortunate that the customers here have seemed to like the products that we are making available. Obviously it’s a combination of [having] a good quality product at an affordable price, with the software and UI [user interface] experience that Indonesian consumers love. We think that we have something that is of value and continue to push our products here to meet that demand. WSJ: Of all the operators in Indonesia, how did Xiaomi finally partner up with XL and why now? Mr. Vickers: We started speaking with network operators last year; unfortunately we didn’t have enough inventory to enable us to do bundling deals with network operators in [the fourth quarter] of last year. We have increased inventory, [so] we’re happy to roll out this marketing campaign in conjunction with network operators. XL is the first one, and we have every intention of working with Telkomsel and Indosat later this year. WSJ: How does Xiaomi plan to address grumbling from consumers about limited supplies and slow roll-out of new models? Mr. Vickers: It’s an issue that we’re struggling with ourselves. It does take a while to roll products out here in Indonesia because of the hostile approval process… [It] is such a long extended issue for us to deal with. WSJ: Does Xiaomi plan to narrow the delay from the time when a device begins selling in China to when it reaches Southeast Asia? Mr. Vickers: Yes absolutely. [We] have started it this month. It’s too long, I agree. We need to bring our products out here faster.